Now before the Feast of the Passover, when Jesus knew that his hour had come to depart out of this world to the Father, having loved his own who were in the world, he loved them to the end. 2 During supper, when the devil had already put it into the heart of Judas Iscariot, Simon’s son, to betray him, 3 Jesus, knowing that the Father had given all things into his hands, and that he had come from God and was going back to God, 4 rose from supper. He laid aside his outer garments, and taking a towel, tied it around his waist.5 Then he poured water into a basin and began to wash the disciples’ feet and to wipe them with the towel that was wrapped around him. Serving others is a value that Jesus modeled extensively in His time with His disciples. There is no clearer depiction of that than in the passage above. Jesus, the Teacher/Son Of God, is aware that the custom has been skipped or overlooked by His followers. What does Jesus do? He doesn’t point it out and or guilt someone into doing the right thing. Instead, He gets up, humbly taking on the role of a servant. There is much to be said about modeling service and servanthood, but I’ll just address a few of them in this post. At the core of service is the heart/motivation for what we do for others. Jesus demonstrated three essential things required to serve others well. To serve others well, value people over plans. Jesus knew that his hour had come to depart out of this world to the Father, having loved his own who were in the world, he loved them to the end. This wasn’t a rush service job. Even though Jesus knew His time to die was close, He took this intimate time with His disciples and deliberately washed their feet. Painstakingly, Jesus poured the water, over each foot, drying each with the towel. He could have asked them all to line up, get ready for a mass service project; but He didn’t. The plan was to die, but He took the time to serve each one there. This communicates volumes about Jesus’ concern about others. He didn’t plow through the people to just get it done! He loved them to the end. He showed them value and esteemed them greatly. That’s what serving others well looks like. To serve others well, be confident, courageous and elevate others. Jesus, knowing that the Father had given all things into his hands, and that he had come from God and was going back to God, 4 rose from supper. Serving others well means that we have to be confident and courageous enough to stoop down to serve. Jesus knew who He was, to Whom He belonged and therefore, He was able to give the very best of Himself to others. Confidence is not found in belittling or berating others. Real confidence is found in knowing why you exist and for what purpose. It is found in knowing to Whom you belong and that you are unconditionally loved. Jesus knew His Father well along with His purpose and plan. His identity was not found in what He was doing (washing their feet as a servant) but in His relationship with His Father. When we truly know who and whose we are, we are free to be and to serve others around us with confidence and courage. It truly takes courage to elevate others, because it is an act of hope for others’ success, even by your submission. Serving His disciples was not “below” Him; it was an act of unconditional love. Jesus was able to show this kind of love because He Himself was love and wrapped in the Love of the Father. To serve others well, love God and love people. …he loved them to the end. Jesus modeled what serving others looked like very well. He showed that it was more about loving God and people than the acts themselves. For some, love will only go “so far” but not for Jesus. He loved them all the way unto the end. His service was not just when it was convenient or easy but modeled that at any given time, serving well means loving well. He was compelled by love in everything He did having no ulterior motive or hint of self. Jesus loved His Father and followers with pure unadulterated love and He expects us to do the same. Do you rush through tasks you do for others? Do people feel valued and cared for by you? How do you make people feel? Unimportant? Projects? Valued? Loved? Seen? Heard? Is there anything you wouldn’t do for others? For Jesus? How confident are you in who you are? To Whom you belong? Do you have a problem in helping others succeed? 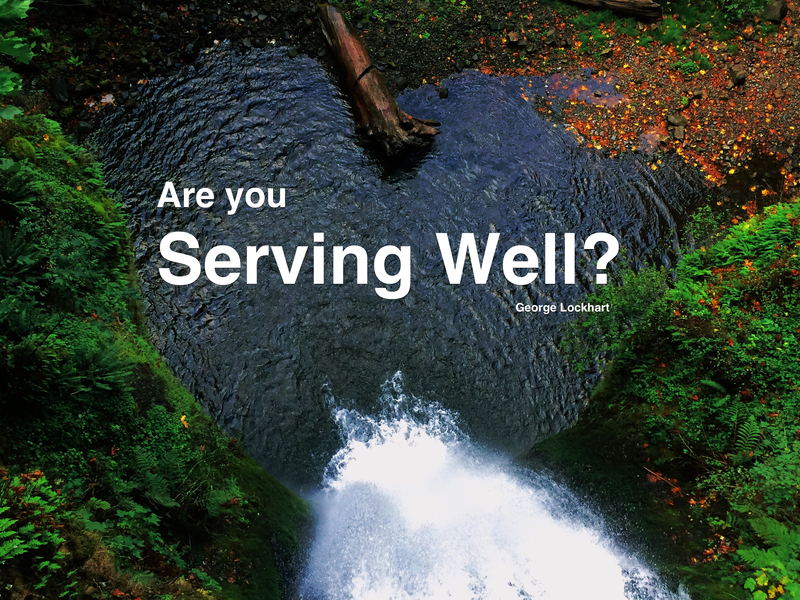 What is at the center of your motivation for serving others? Is it to get something in return?